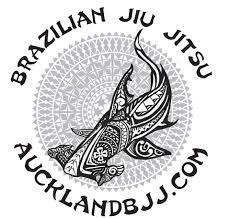 Rener and Ryron have promoted her to blue belt in Gracie Jiu Jitsu. She is the head instructor at Gracie Jiu Jitsu Fort Collins. They are affiliated to Rener and Ryron as they are one of their Certified Training Centers (CTC). In this picture, she wears a black belt with a red tab and 2 degrees. Apparently, it is a her Karate rank. 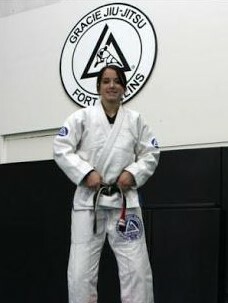 Not sure why she would wear it with an official GJJ gi and the Gracie logo in the background. But it seems that they also offer their own Karate classes while running the Gracie Jiu Jitsu Fort Collins. Maybe she forgot to change belt for the picture.